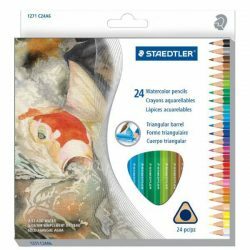 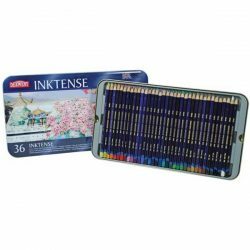 Inktense Watercolor Colored Pencils (36 count) by Derwent. 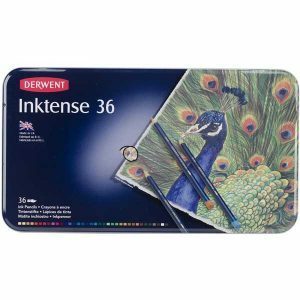 Derwent Inktense Pencils are the best water-soluble pencil ever! You can use them dry but mix them with water and the color turns into vibrant ink. 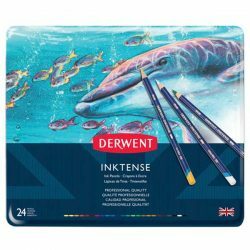 Once it is dry the color is fixed and because it is permanent and great for using on fabric such as silk and cotton. 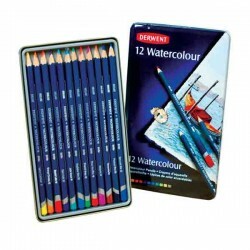 This package contains thirty-six pencils in Sherbet Lemon, Sun Yellow, Sienna Gold, Tangerine, Poppy Red, Chili Red, Cherry, Shiraz, Red Violet, Fuchsia, Mauve, Violet, Peacock Blue, Iron Blue, Iris Blue, Bright Blue, Deep Indigo, Sea Blue, Teal Green, Iron Green, Ionian Green, Field Green, Felt Green, Apple Green, Leaf Green, Mustard, Tan, Saddle Brown, Baked Earth, Willow, Bark, Indian Ink, Charcoal Grey, Ink Black, Antique White and Outliner within one tin.